Well, what can I say? My name is Stanley Shipkowski. I'm 53 (tick tick tick). People say I look younger. My immaturity gives me a boyish quality. I was was born in San Jose, California and grew up in Sunnyvale. I've been a Registered Nurse for a little over three years. I first worked at the University of Chicago Hospital. I'm now at Iowa Methodist Hospital in Des Moines. I think the best part of the job has to be the sexual tension. But hey, I kid. 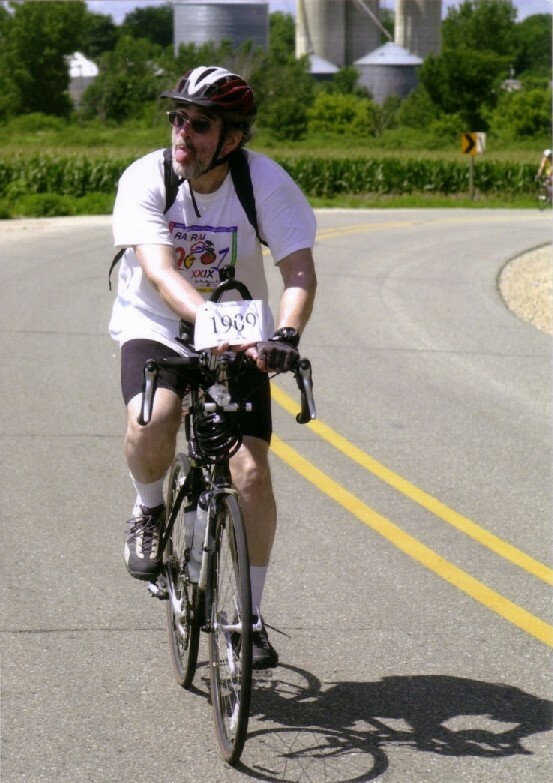 The picture was taken last July during RAGBRAI. That's the bike ride across Iowa, from the Missouri River to the Mississippi River, hence the silos and corn cribs in the background. When I'm not healing the sick, raising the dead and growing hair on a bald head, I like to do music on my computer. I was in lots of rock bands during my misspent youth and it's a part of me that I won't allow to die. Screw the neighbors! My computer is set up to be a multi-track recording studio. I do both MIDI and digital audio with PowerTracks ProAudio 8. It's the most fun you can have with your clothes on. Although I have been known to do it the other way as well. My politics are very liberal. Now that the oligarchy has control of all three branches of the federal government, I expect to see our civil liberties quickly eroding in the name of "security". Quit picking on the French. At least they are standing up to the shrub, which is more than the Democrats are doing. I'd like to hear from some Canadians.